There’s a new line on the horizon and we’re please to introduce you to it. If your skin seems to be extra sensitive, flaky, dry or red this time of year, then this line is for you. What sets this line apart from others? 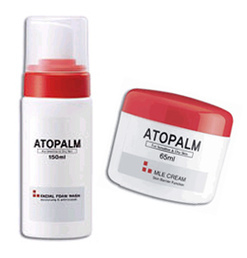 ATOPALM has a patented MLE technology, which helps restore the skins’ lipid layer that can be broken down in these colder months. Think of these as a toothpaste made for when your teeth are sensitive. The 7-product line has ones for your face and body and they have a great kit with nice sized versions, which I always say is the only way to try any line. The Skin Repair Kit ($99 only @ dermstore.com), contains a Facial Foam Wash (5.06oz), MLE Cream (2.19oz), MLE Body Lotion (4.05oz) and MLE Face Cream (1.18oz). These are worth a try.